Hasan Alsalh was one of the first Syrian newcomers in the province to die, casting light on a problem for the growing Muslim community: where to bury the dead. Hasan Alsalh was mute, but he smiled often. Because of an accident, he communicated with gestures and facial expressions and was especially fond of animated heart stickers and emojis. His smile was the same whether he was meeting a stranger or talking to people from his hometown of Daraa, Syria. 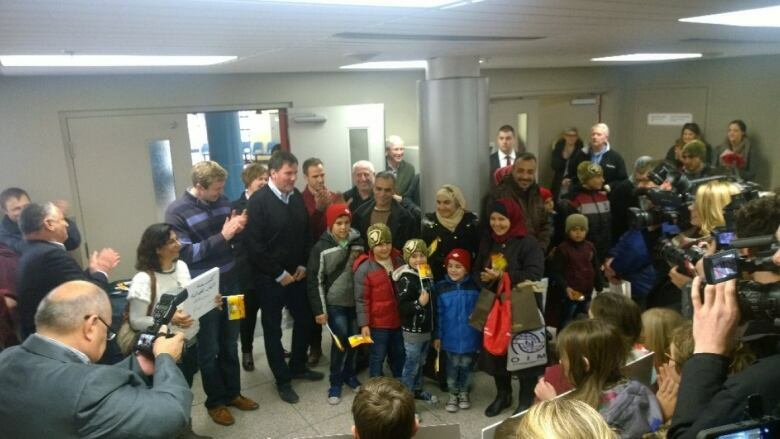 The father of five was one of the first Syrian refugees to settle in New Brunswick in 2015. The tradesman took English classes at the Multicultural Association of Fredericton and, two winters ago, went snowmobiling with his children for the first time. 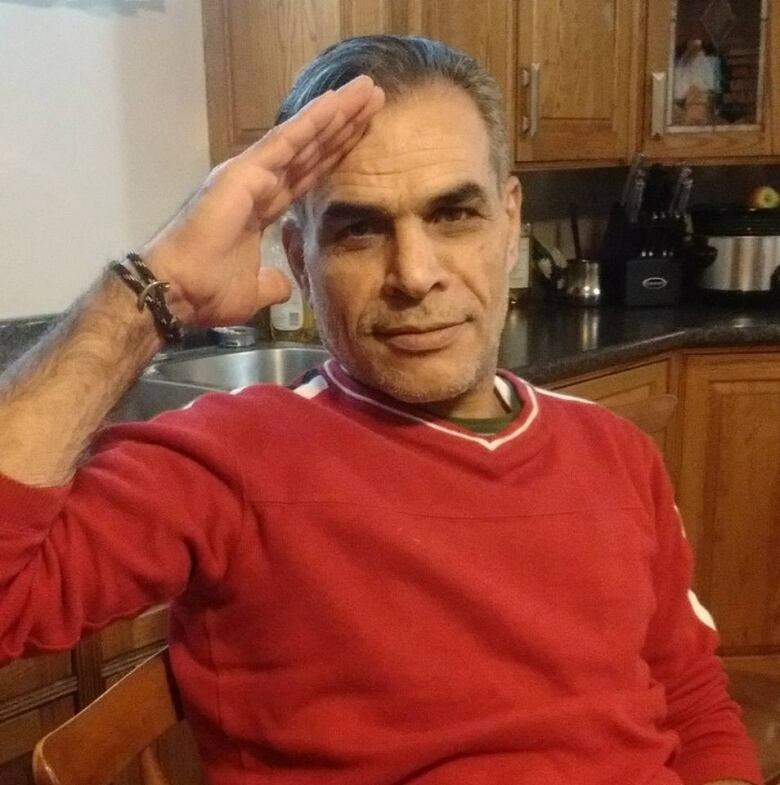 Alsalh, 49, was also one of the first Syrian newcomers in the province to die, casting light on a problem for the growing Muslim community: where to bury the dead. Alsalh got sick quickly in early September, dying within 48 hours of arriving at the Dr. Everett Chalmers Hospital. It was up to the survivors, including his friend Mohammad Bakhash, to figure out what came next. Some things were painful but routine: breaking the news to Alsalh's teenagers, and figuring out the logistics, including a death certificate. But the routine ended there, Bakhash says. Getting Alsalh buried was more complicated. Alsalh's body had to be taken from a Fredericton funeral home to Sussex, a 120-kilometre drive away, because that's the nearest Muslim cemetery in the province. Alsalh was a close friend of Bakhash; their bond wasn't difficult to forge. The two men arrived in Fredericton just a month apart, both Syrian refugees trying to start a new life in a province where fewer than 3,000 Muslims lived. When you start a new life, Bakhash says, you're thinking ahead — about the language barrier, your children adjusting to new schools and new friends, your own career, trying to get accreditation in your field. You're not thinking about where you're going to be buried. Much like in life, Muslims must follow specific, but varying, rules when someone dies. People have different interpretations of Sunnah, or the teachings of the Prophet Mohammed, regarding the practical aspects of burials. Some people believe headstones should be simple and uniform, because rich and poor people are equal in death and in the eyes of God. Others do not forbid ornate headstones. Some people believe there should be an exact 10-metre distance between where Muslims and non-Muslims are buried. Others also believe the deceased must be in the ground within 24 hours of their death. But the basic rules are mostly the same: the body must be washed and wrapped by family or close relatives shortly before the burial, the funeral must be quiet, the body should be prayed over by funeral attendees, and the cemetery must be fairly distant, or at least fenced off, from where non-Muslims are buried. Generally speaking, a Muslim cemetery must, therefore, be separate and have a building with running water, where the body can be washed and wrapped. The procession to Sussex for the burial of Hasan Alsalh — 75 people in 20 cars, driving down Highway 2 to a small shared cemetery — was disheartening. "We use the highway, which included a high rate of risk for the people who are in the ceremony and for the people who are using and sharing the highway with us at that time," says Bakhash, who believes burial is a basic human right. "For many times, we have to stop at the right of the highway waiting [for] each other, some people were slower than the others. "We moved him by my own car, which is not provided with any cooling system. So it was really hard time." Bakhash and the procession had trouble finding the cemetery at first. It's a few kilometres east of the centre of Sussex, a town of about 4000, at Evergreen Memorial Park. A U-shaped road leads in, then out of the Evergreen cemetery. The Muslim section is at the point where the road turns back around. It's cordoned off by a green, metal fence. At first glance, the section looks empty, because the headstones lie flat on the ground. Usually, a plaque bears only the name of the deceased, year of birth and year of death. Some are also inscribed with "mother" or "my angel." A highway overpass runs perpendicular to the cemetery and looks down on the green. The silence of the space is punctuated by the sound of cars and trucks whisking by and an occasional bird caw. After the body of Alsalh was washed and wrapped in cloth, 25 men carried it on their shoulders to the gravesite, chanting the Tawhid in Arabic, which translates to "There's no God but Allah." They placed the modest cardboard coffin on the ground, facing the direction of Kaaba in Mecca, and stood shoulder-to-shoulder to pray over the body a final time, before lowering the coffin into the ground. Burying his friend made Bakhash wonder what his family — his wife and four young children — would go through if he died. Would they have to make this trek in the winter? "I might be the next, so who should handle the process at that time? … Would we like to wait for summer, for example, to have good weather to have safe drive? Some things don't wait for our circumstances. We have to face regardless of the weather, regardless of whatever." Twenty years ago, if a Muslim died in New Brunswick, the family had to drive the body to Truro, N.S., for the burial. That's where the only Muslim cemetery in the Maritimes was. Mohamed El-Bayoumi of the Fredericton Islamic Association was there when people in Moncton, Fredericton and Saint John decided Truro was too far and put their dollars together to buy five acres in an existing cemetery in Sussex, a town of 4,000 people in the south of the province. "It's been serving us really, really well," El-Bayoumi says. He moved to New Brunswick from Egypt four decades ago to study at the University of New Brunswick. When he wasn't power boating or competing in swimming meets, he was conducting marriage ceremonies and funerals. He's also been an imam, leading prayers at the mosque on Lincoln Road. Mohamed El-Bayoumi was asked by the Fredericton Islamic Association to find land to bury Muslims closer to home in Fredericton. Much like his studies in engineering, the business of cemeteries in New Brunswick is about numbers, he says. When he moved to New Brunswick in the 1970s, he was one of a handful of Muslim people there. In the early '90s, the population increased slightly, to 15 Muslim families from all over the world, some Arabic-speaking from the Middle East like himself, others from India and Pakistan. That growth prompted a push for a New Brunswick cemetery. But why the sleepy town where there are virtually no Muslim residents? El-Bayoumi says the idea was to find a somewhat central location, where it's not favouring one of the big cities while still being able to afford the price of the land. In November 2015 the government of Canada committed to taking in 25,000 government-assisted refugees from camps in Lebanon and Turkey, as well as directly from Syria. Almost 2,000 settled in New Brunswick. "We're probably a thousand individuals [in Fredericton], so the statistics and the possibility, the probability, of having death — it's becoming more and more frequent than before," El-Bayoumi says. El-Bayoumi is retired now and has been focusing solely on finding space for a Muslim cemetery in Fredericton. Every Friday after the prayer, people approach him and ask: when are we going to have a cemetery? "They consider it a bit off the main track," he says of Sussex. "It's not Saint John, it's not Fredericton, it's not Moncton. Who knows about Sussex? Where is Sussex? "In particular, with the newcomers, the new arrivals and the new generation, they don't want to do this. They want to have something here in Fredericton." A lot of people don't have the means to make the trip to visit the graves of loved ones, which Muslims are expected to do at least twice a year. "In our culture, as you know, you're supposed to visit the cemeteries now and then because it shows you the finality of life," he says. "So it's a very good reminder that this is where all of us gonna go. "It's time to search when you are alive. When you die you're not going to look for a place at that time. You search now and you prepared now not to wait for the last minute." The Islamic rules are not the only hindrance. For a while, it was also about money. The Fredericton Islamic Association bought a piece of land in 2014, but it turned out to be wet and not suitable for digging and burying. After a few more years of searching and fundraising El-Bayoumi found a promising spot: one in an existing cemetery at St. Francis of Assisi church in Lincoln. "That is a win-win situation because we help the existing cemetery, we help with the cost of running it and operating it and at the same time we have a place," he says. This is exactly what Moncton did in 2009, when two elderly men took it upon themselves to raise money, buy land and partner with a funeral home to run the burials. The one thing that was holding El-Bayoumi back was that he needed permission from the Catholic diocese to be able to buy the land. He sent a letter explaining the Muslim community's predicament and offering $30,000 for the land on Aug. 24. The group then waited weeks for a response. When CBC News began making calls about the potential arrangement, the church contacted El-Bayoumi and asked for a meeting. They still need to figure out logistics but El-Bayoumi says this purchase could be ideal for the community and reassure members there's somewhere to bury their loved ones. "A Muslim cemetery is no different than any other cemetery," he says. "It does not generate anything in particular other than a reminder to all of us, all people of the book, all humans, that we all going to die." Church officials haven't returned CBC News calls but have met with El-Bayoumi and assured him they will do their best to help, he says. "I believe it's one of the basic human rights for any part of the society to have a place for their beloved people, to have them to be close enough to visit them at any time, to pray for them, to eases the process of having them at the cemetery," Bakhash says.